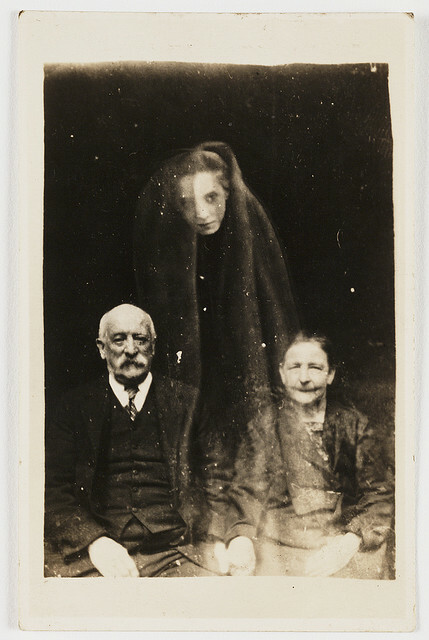 Today I would like to write about the subject of spirit photography. 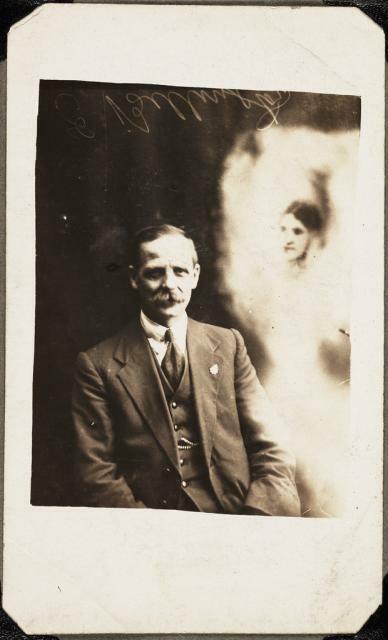 Is it possible that ghosts and spiritual entities, assuming they exist, can be captured in photographs? Many such claims have been made and I'd like to focus in particular on a historical case of one individual in particular by the name of William Hope (pictured left) who lived between the years 1863 and 1933. 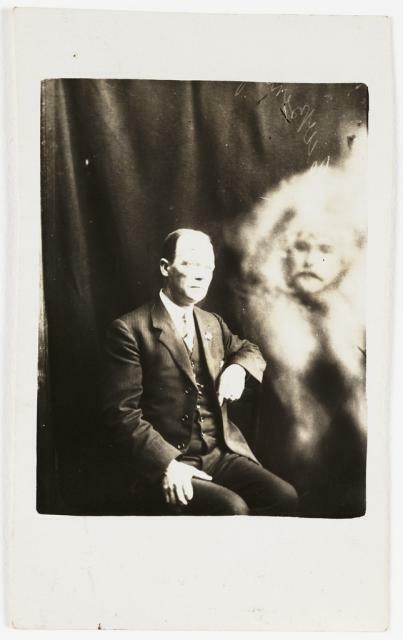 Originally employed as a carpenter, around the year 1905 Hope supposedly discovered his ability to take spirit photographs by accident. Hope was taking some photographs with a friend and found that when the photographs were developed, a transparent lady was present in one of these pictures. Hope's friend recognised this lady to be his sister who had been dead for many years. William Hope said; "I knew nothing at all about Spiritualism then. 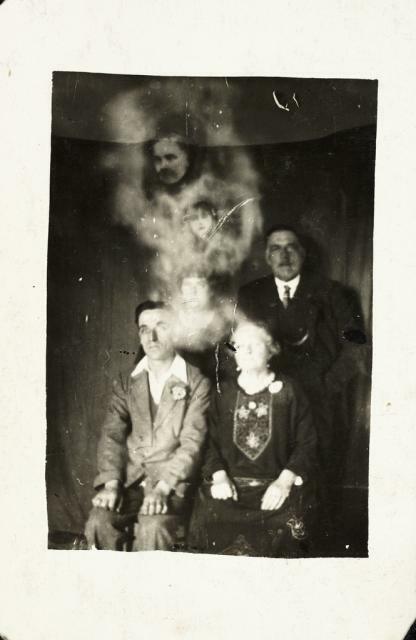 We took the photograph to the works on Monday, and a Spiritualist there said it was what was called a Spirit photograph. He suggested that we should try again on the following Saturday at the same place with the same camera, which we did, and not only the same lady came on the plate again, but a little child with her. I thought this very strange, and it made me more interested, and I went on with my experiments." 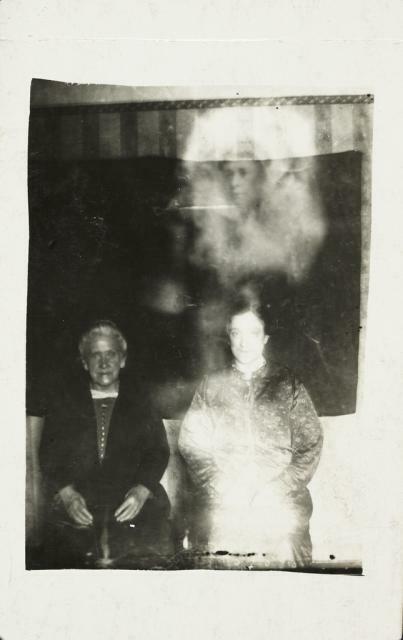 Archdeacon Thomas Colley who had been a psychical researcher for about 40 years, helped to bring William Hopes spirit photography to public attention. Archdeacon Thomas Colley had set out to test whether Hope's photography was genuine and he went along to meet William Hope and he would apparently even bring his own camera and simply asked Hope to take the photograph. Colley would then develop the plates using his own chemicals. 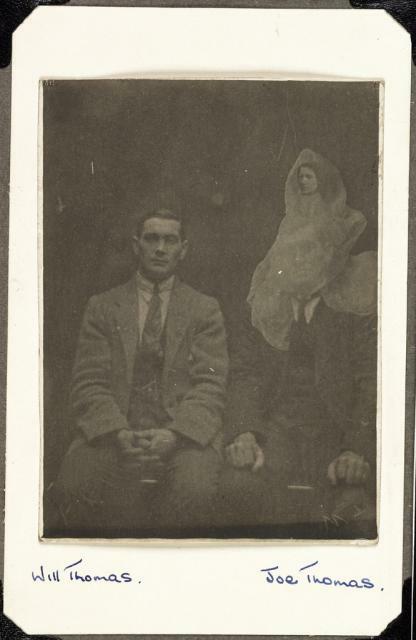 It was claimed that even under these conditions, spirits would still appear in the photographs, convincing Thomas Colley that Hope's abilities were genuine. 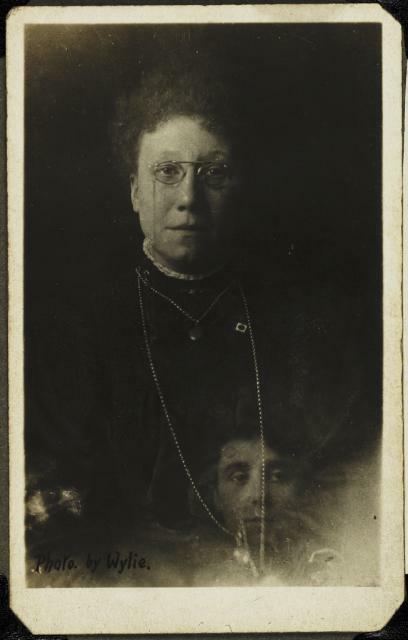 Hope then formed (and was leader of) what was known as "The Crewe Circle" Spiritualist group. The name was adopted because the group was based in Crewe, England and was set up to provide a service to the public where people would visit and have their photograph taken in the hopes of capturing an image of a deceased loved one. 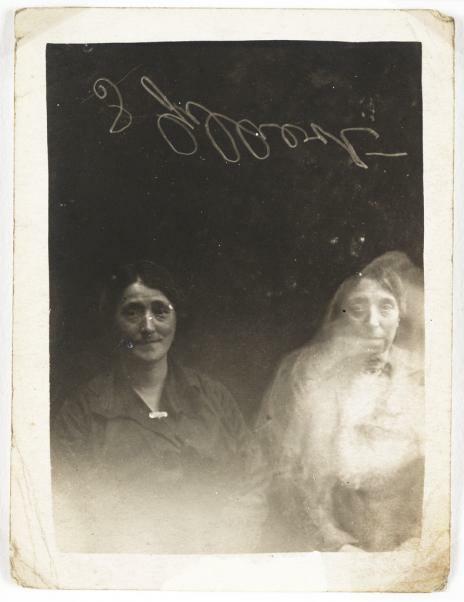 Thousands of photos were taken, capturing what were supposedly spirits of the dead. According to records, Hope would only charge a minimal fee to cover equiptment costs and time taken to take the photographs. Believers in William Hope's abilities would say that he had no motives for fraud, since not only did he originally have no interest in or knowledge of spiritualism, but he was not making a huge fortune in doing it. 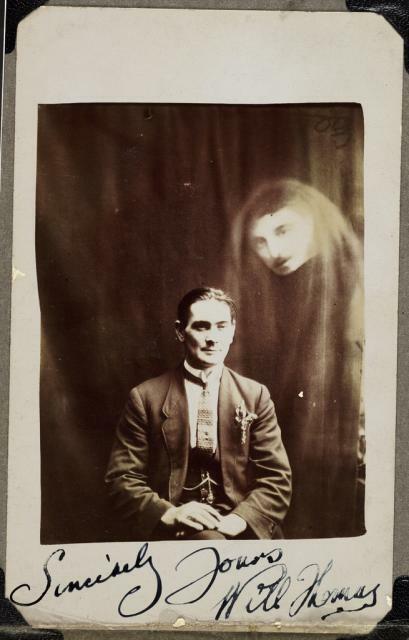 As has been the case with all spirit photography, there has been a great deal of controversy surrounding whether or not Hope's photography was genuine. "controversy arose in 1922 and was, on the surface, damning for Hope. In a report published in the Journal of the Society for Psychical Research he was accused of imposture by Mr. Harry Price. The accusations were later published in a sixpenny pamphlet. 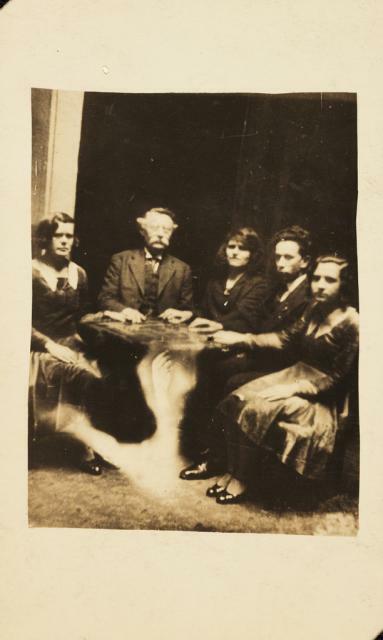 The basis of the revelation was that Mr. Price, in a sitting at the British College of Psychic Science, caught Hope in the act of substituting the dark slide, holding the exposed pates, by another; further that he (Hope) handed him two negatives (one of which contained a psychic extra) that did not bear the secret mark of the Imperial Dry Plate Company specially impressed on the packet of films by X-rays and which were different in colour and thickness from the original plates." In other words, investigator Harry Price had apparently secretly marked the plates Hope was using in his photography equipment. 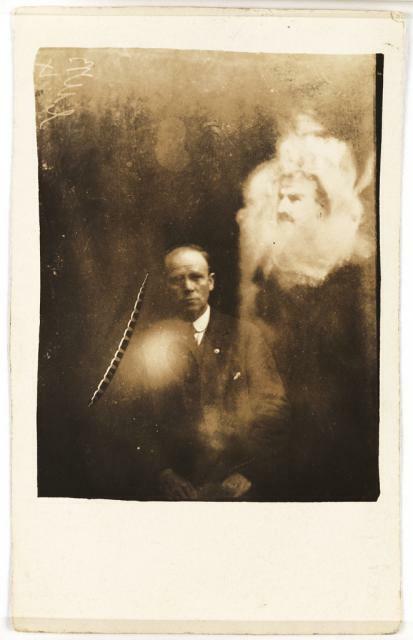 Not knowing this, when Hope attempted to produce spirit photographs, none of the photos he produced contained the marks which Price had secretly etched on, which suggests that Hope had exchanged the materials to ones with fake spirit images. "Subsequent investigation proved that the counter-accusation raised by spiritualists of an organised conspiracy against Hope deserved examination. The wrapper of the packet was found, and it bore marks of tampering. Moreover, one of the original marked plates was returned anonymously and undeveloped to the S.P.R. a week after the experiment and three weeks before the revelation. On being developed it showed an image. As the packet of marked plates was lying about for four weeks in the office of the S.P.R. it was open to tampering and substitution, it being also likely, in the view of the Hope-apologists, that the abstractor sent back the missing plate out of pure mischief. Immediately after the revelation Hope offered new sittings and declared his willingness to submit himself to stringent tests. The offer was refused. Harry Price, however, signed a statement to the effect that the test of February 24, 1922, 'does not rule out the possibility that Hope has other than normal means.' Indeed, no less authority than Sir William Crookes bears out the true mediumship of William Hope in an authorised interview published in Christian Commonwealth on December 4, 1918. On his own marked plates, under his own conditions, he obtained a likeness of his wife different from any he possessed. On the other hand Sir Oliver Lodge was emphatic in stating concerning a test of his own with a sealed packet sent to Hope: 'I have not the slightest doubt that the envelope including the plates had been opened.' 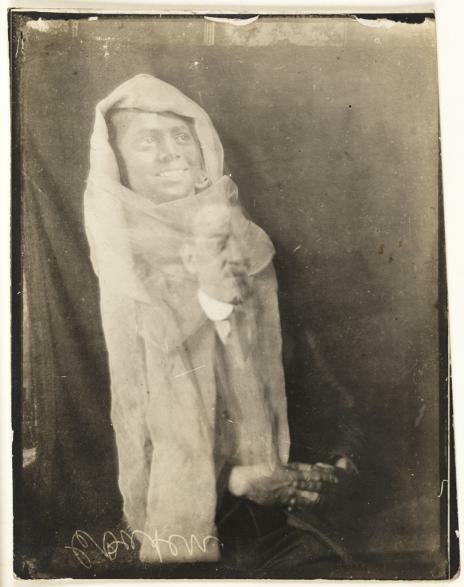 Again Sir William Barrett claimed to have received with Hope 'indubitable evidence of supernormal photography.'" 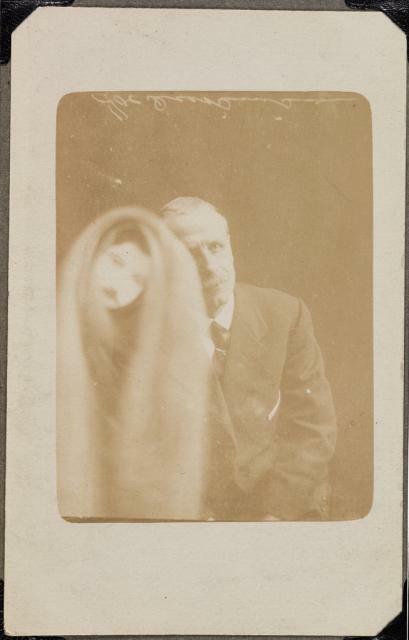 "The attack upon Mr. Hope, the psychic photographer, was examined by a strong independent committee and was shown to be quite unsound, and even to bear some signs of a conspiracy against the medium." 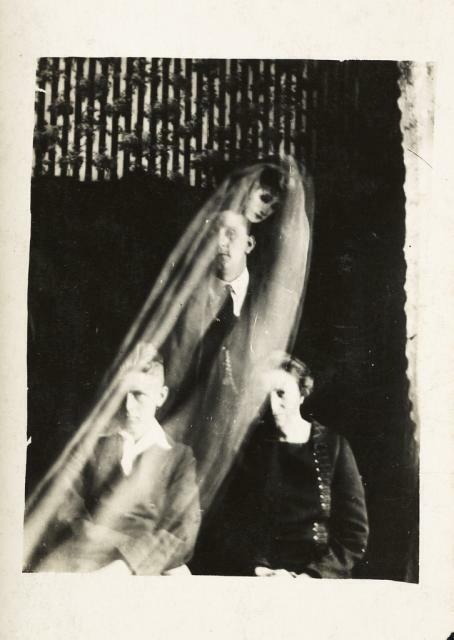 Here is a collection of some of the spirit photographs taken by William Hope. They are as interesting as they are creepy. 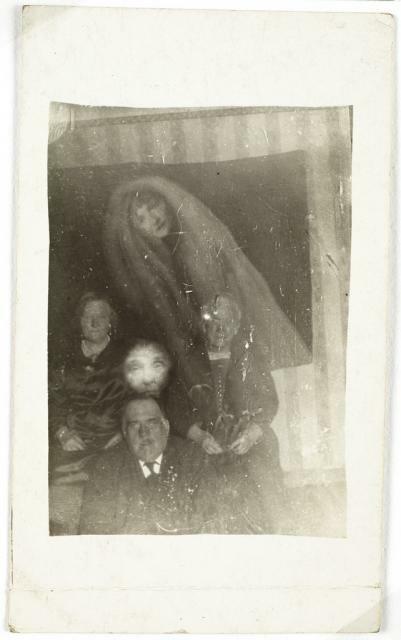 Perhaps what makes these photographs even more creepy in my opinion is the fact that everybody in the photographs pictured with the alleged spirits are now themselves long since deceased. To modern eyes these photographs may be immediately dismissed as fakes that can easily be explained as double exposures. My own view is they do simply look "too good to be true". 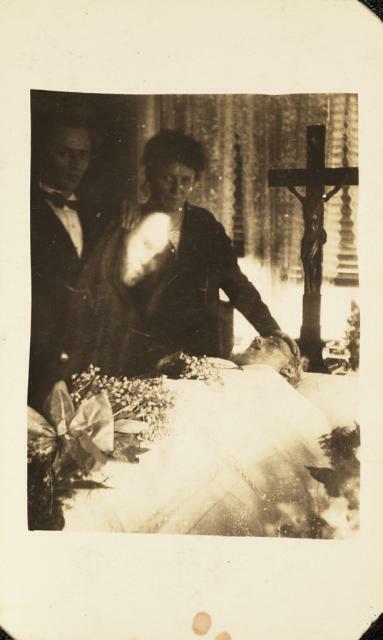 There are to this day some examples of spirit photography where very solid looking figures will appear as ghosts in an image, but the idea that someone could take hundreds or thousands of these? Despite my immediate reaction that these photographs are obvious fakes, I always try to approach every subject with a completely open mind. I think the story of William Hope is an interesting one and the notion that his abilities were put to the test by some individuals who were unable to find evidence of fraud, combined with the mystery and allegations of conspiracy surrounding those who did claim to expose Hope as a fraud, allow people to this day to continue to entertain the possibility that these photographs just might be genuine. 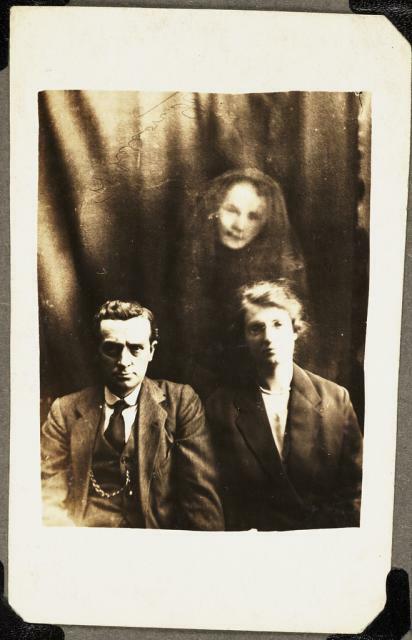 So, here are a collection of William Hope's spirit photographs.